FANGORIA: Do you think the Marshal is still relevant 25 years later, and are there any plans to put him back on the streets? 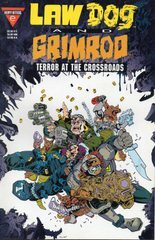 PAT MILLS: Probably more relevant now than back then, because we live in such a beaten down world today where there is little social change and idealism has been crushed. I’d love to see him back, but it feels problematic because Kevin’s on THE LEAGUE OF EXTRAORDINARY GENTLEMEN and I’m on other things. But I do need the outlet to attack heroes, so I do a bit of potshotting at them in DEFOE (Mills’ current 2000AD steampunk zombie series) where there are the 17th century Vizards, smug establishment superhero bastards who Defoe–the last Leveller–wants to kick their heads in. See, it’s still in me! FANGORIA: Grant Morrison is actually fond of comparing superheroes to the ancient gods, arguing that they fulfil a similar mythological need in our modern psyche. Is it this sort of deification that bothers you? Should we have moved past myths and gods by now? 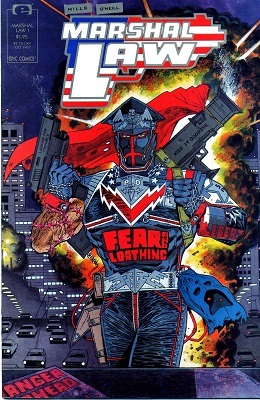 PAT MILLS: Yeah, I think the deification of superheroes is rather worrying. The neo-Christian elements, e.g . Messiah Syndrome, have been written about before, although not in a critical way to my knowledge. Abdicating our power to messiahs is a dangerous business. FANGORIA: You clearly have a deep and abiding loathing for superheroes. Which, in the age of THE DARK NIGHT and THE AVENGERS, must be fun for you! Do you feel superheroes have moved on at all since you first started putting the boot in during the 1980s? PAT MILLS: Nah. They seem more self aware and pretentious now, but the 21st century so far is hardly a time of creative progress. 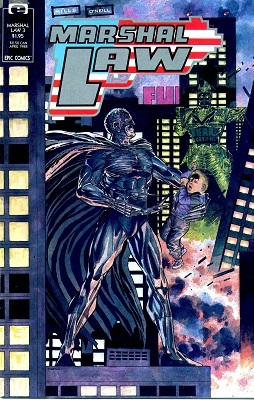 I read some highly-rated Superman origins book by Grant Morrison a couple of years back, expecting some new Scottish insights into the character and was surprised by how deferential it was. Well, I guess that’s what the fans want. Don’t blame us. If they want the forelock tugging approach it only reflects the wider world. 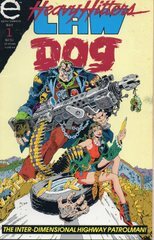 As I mentioned last time, Lawdog had his own series under the Heavy Hitters label. Let's look at the first issue. Yep, 90s. Which isn't to say Lawdog didn't have its own charms, especially early on. Art by Flint Henry. 9 pages of 28, plus an early Halloween treat. 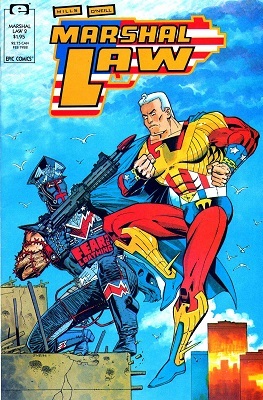 Comic books in the 1990s are stereotyped as being about overmuscled men with big guns and gritted teeth engaged in mindless violence. I am totally playing to that stereotype with today's offering, but with some characters you might not have seen in a while. 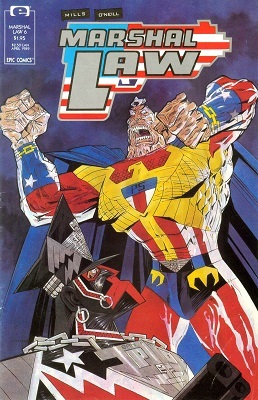 Epic Comics was Marvel's "creator-owned" subdivision that printed more "mature" titles, and ones that didn't fit into the Marvel Universe, so the creators could re-use the characters elsewhere. The "Heavy Hitters" line tended towards macho violence. As a cross-promotion, they did a handful of team-up specials. I've selected fifteen of the forty-eight pages for your entertainment. Current Music: "Two Hours of Celtic Music"
Here we are at the last issue. The Queen is dead, but the trial continues; once again I've skipped all the trial pages and am just posting the post-verdict part of the story. Coming up next: the Sisterhood of Steel graphic novel. Featuring much, much better art than in the comic book series, and also much, much more violence. This issue feature's Boronwë's trial for treason. Which means it's mostly talking heads and visually very boring. I decided to just post an excerpt from the first half of the comic, where we meet Boronwë's lawyer and discover the source of the animosity between Vandalis and Lanna. Picking up where we left off before the holiday, with Sisterhood of Steel #6. Suggested tags are: title: Sisterhood of Steel, creator: Christy Marx, publisher: Epic. Only 3 more issues to go, and then I'll post excerpts from the graphic novel. Once again, while these comics were never reprinted, several complete sets are available on ebay for below cover price, and torrents of the series are also available. There's a lot of setup in this issue for future developments. Rather than try to post excerpts from that, I decided to post the last nine pages, in which Boronwë's ship is attacked by slaver pirates. The first issue introduces the protagonist, Boronwë, and tells us the origin of the Sisterhood. It also sets up the conflict between Boronwë and the princess Vandalis. That conflict takes centre stage in this issue, but first we get this lovely double splash as Boronwë equips herself with weapons and armour. That splash encapsulates several of the things that rock about this series: characters of varying body types, multiracial casting, and fantasy warrior women who actually wear real armour and have real muscles. So, issue 2 has: ninjas, pirates, drug trips, assassination attempts, sword fights, and psychedelic-assisted sisterly bonding. What more can you ask for from a comic? Well, the next issue has international politics, slave traders, and more pirates. As to the title, sometimes I agree.